Indonesia is a tropical, archipeligo country in Southeast Asia, just above Australia in the Pacific and Indian oceans. It’s bustling capital city is Jakarta, located on the island of Java (where yes, coffee is grown, a result of its rich volcanic ash soil). Java is the country’s largest island, and one of the most populated on the planet as a whole, with more than 140 million people. And Jakarta is a vibrant, heavily populated, lively metropolis that is definitely worth exploring. Weather is typically tropical in all of Indonesia, which makes it typically beautiful and balmy and a year-round travel destination! But there is a rainy season from December to March, so keep in mind that as a less developed country remoter areas can become difficult to traverse during these months. There are two international airports in Indonesia: Ngurah Rai Airport in Denpasar, Bali, and Soekarno-Hatta International Airport in Jakarta. The national airline is Garuda Indonesia but it does not fly to North America. Since there are no direct flights from Canada to Indonesia, you will have to transfer in Japan, Korea, Hong Kong, Taiwan, Thailand or Singapore. Keep in mind that the departure tax from either international airport is $200,000 IDR (about $20 CDN) as of March 2017. Because Indonesia is made up of thousands of islands (although five main islands and another 30 smaller ones hold the majority of the population), you can’t really travel overland from place to place. You can, however, take a ferry or use the domestic air service. Keep in mind that plane tickets bought in Indonesia in Rupiah are about half as much as those bought beforehand in Canada. On the islands, buses are the primary mode of travel and include economic, express and luxury air-conditioned buses. In the towns, you can rent a car, motorbike or bicycle, but note that driving on your own can be confusing in high-traffic areas. If you do decide to drive a car, you must be over 18 years of age, and have an International Driver’s License or license for ASEAN (Association of Southeast Asian Nations) countries. On the other hand, there are also “bemos” (popular mini-vans or pickup trucks that function as buses), auto rickshaws, bicycle rickshaws and horsedrawn carts for next to nothing (and hey, they’re more fun!). There are about 120 active volcanoes in Indonesia, any of which you can climb to add a bit of excitement to your travels. In East Java, Mount Bromo is the most popular volanco to climb in the country and is surrounded by deep canyons, freezing lakes, waterfalls and caves. Bali is a key destination for travellers in Indonesia, and for good reason. It is the ideal tropical paradise, with a backdrop of rice paddies and volcanoes stretching from west to east, tropical forests, crater lakes and ravines, and white sandy beaches along the southern coast. Water sports in particular are popular and can be arranged by most hotels, and at the Beluga Marina in Tanjung Benoa, not too far from the airport in Denpasar. Indonesia offers many beautiful remote terrains for jungle trekking, some of which are among the oldest jungles in the world. 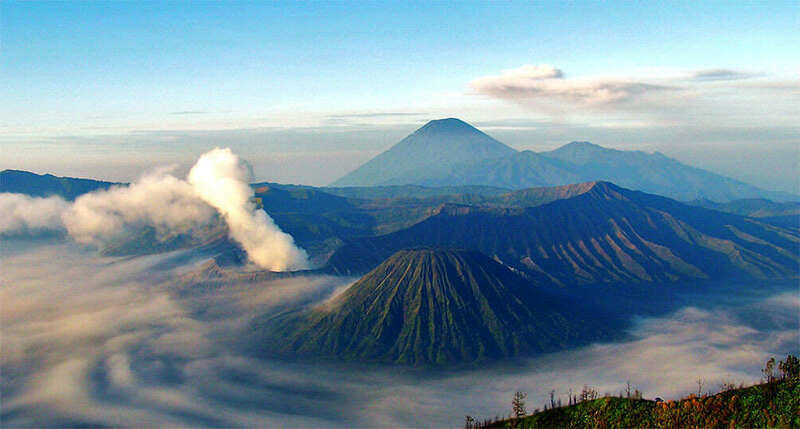 In Sumatra, the most popular destination is the Bukit Barisan Selatan National Park. Here you can see Sumatran elephants, barking deer and clouded leopards. Kevin Vallely is a longtime expeditioner and athlete, an architect by trade, and contributor to Outpost. Alongside Evan Soloman he lead our Franklin Expedition in the Canadian Arctic, went on elephant patrol in the Indonesia rainforest, retraced the Sandakan Death March in the jungles of Borneo and lead Team Outpost to victory in the Drambuie Pursuit. He lives in Vancouver with his family.